I made this custom matched pair of 6ft (that’s one foot longer than standard) Performance Hybrid Nylon Whips for Satoru in Japan. Their colors include: Charcoal Grey, Silver Grey, White, and Turquoise. 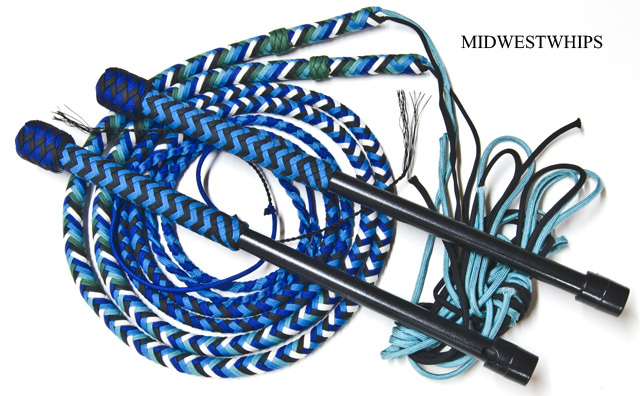 Check out our MidWestWhips Nylon Whips or The Whip Chick’s Nylon Whips page for more information on how to order your own Performance Hybrid whips made by Lauren Wickline, or look at our Whips In Stock page to see if we have any already in stock at the moment. Eric in New Mexico will soon be cracking his new Performance Hybrid Nylon Whip made with Yellow, Purple, and Turquoise Paracord. Have fun, Eric! 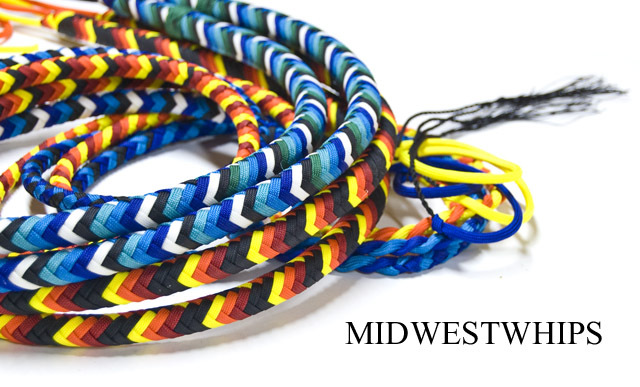 Check out our MidWestWhips Nylon Whips page for more information on how to order your own custom Performance Hybrid whips, or look at our Whips In Stock page to see if we have any already in stock at the moment. This custom 5ft Performance Hybrid Nylon Whip was plaited in Rose Pink, Turquoise, and White. This matched pair of PH Nylon Whips were made for Jillian from six paracord colors: Black, White, Electric Blue, Colonial Blue, Turquoise, and Kelly Green. Check out our MidWestWhips Nylon Whips page for more information on Performance Hybrid whips. This matched pair of Performance Hybrid Nylon Whips was made for Dia in Dark Brown and Turquoise with dark brown handle bases. Best wishes to her and her daughter Alaina who are learning to crack whips together! Two-color handle braiding is available on any PH Whip at no extra cost. Just mention it in your order email! (See How to Order). 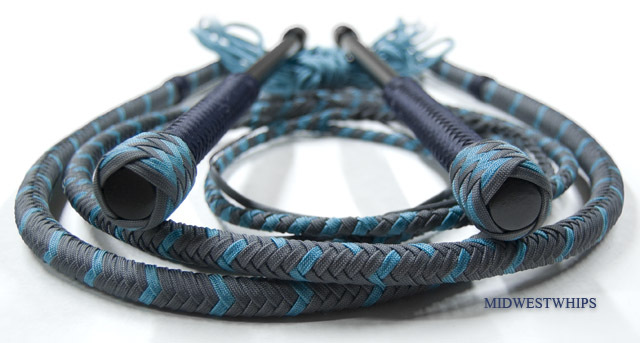 This custom matched pair of Performance Hybrid Nylon Whips with two-tone thongs was made for Takeo in Charcoal Gray and Turquoise with Midnight Blue. The handle bases are black. Check out our MidWestWhips Nylon Whips page for more information on Performance Hybrid whips, including how to order.